The Spider (HC-15, HC-9) digital keyboard is a modular control network compatible with most disable drivers applications for Standard (RELAY) and / or Can-Bus configured vehicles. 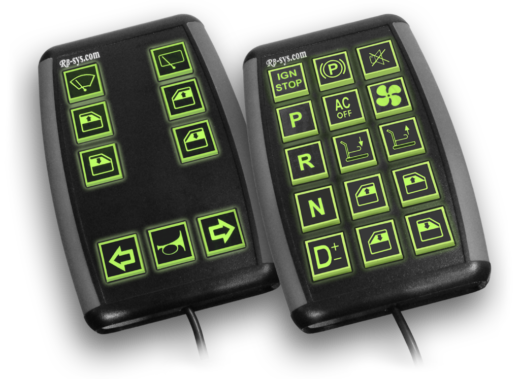 There are two available keypads: HC-15 (a 15-button keyboard) and HC-9 (a 9-button keyboard) The Spider network is designed to control most vehicle functions from a single comfortable location. Using series of specific RB interfaces connected via RB proprietary CanBus protocol the network is super flexible and powerful. As a result of its powerful software, programmable features and modularity, the new Spider HC-15 or HC-9 is the most flexible and versatile electronic keyboard driving aid available today. The HC-15 / HC-9 hard-wire keyboard is a 15/9 push button console keypad. All buttons are large (13.5 x 13.5 mm), easy to access and backlit for night viewing. Each of the HC-15 / HC-9 buttons can be allocated to control a desired function according to the interfaces connected to the Spider network. Button allocation is flexible during system installation. Icon kit is supplied along with the keyboard. Chosen icons are placed on the push buttons according to button allocation.